Workshop intensivo di Native Instruments Maschine in arrivo! here you find a selection of public hyena tracks, snippets, livesets. qui trovate una selezione di materiale pubblico della hyena (tracce, snippets e liveset). The Daily Swarm – The World of Music (On the Internet, In An Infographic)…. Scum From The Sun previous album out now! for RXSTNZ digital! 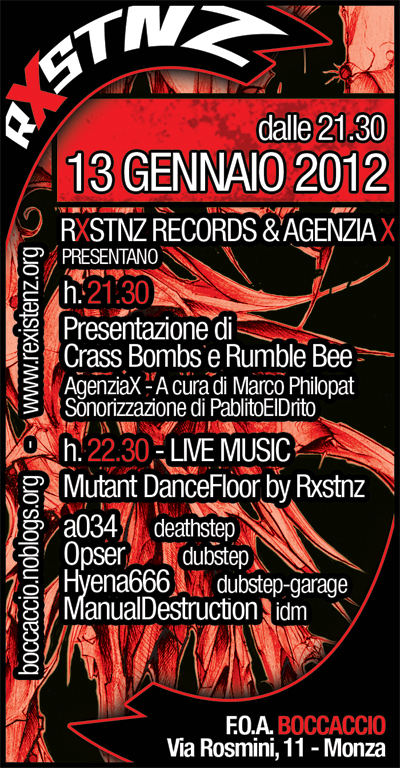 vote for REXISTENZ to have us play Carroponte (milano) in 2012! vota REXISTENZ per farci suonare a Carroponte nel 2012!